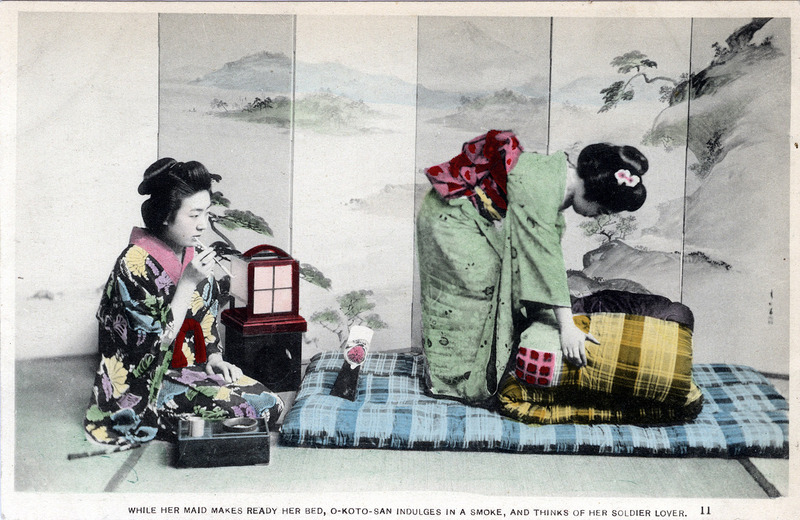 “While her maid makes ready her bed …”, c. 1905. “We ran into some friends who were staying at the Imperial Hotel and they led Gardner into a discourse and glimpses of native life. He began with the bed which is the starting point of Japanese as well as foreign life and the finishing point, too. “‘In Japan,’ he said, ‘you don’t go to bed; the bed comes to you. It is much easier that way and in Japan the easiest way is the only way. That is why the country is so popular with globe trotters. Nor does it make much difference what part of your house you may be in or of a friend’s house for that matter or a tea house or a hotel; if you are drowsy the bed will come in patty pat and will spread out before you at a moment’s notice. “‘If you are visiting, your host will detect your inclinations and beg you to honor his house by taking a nap therein. Clapping his hands he calls out ‘Futon motte koi!‘ (‘Quilts bring here!’) In a moment his wife is prostrate just outside the room hearkening to the august command. In two minutes she will be toddling in with a bundle in her arms much larger than herself – a huge thickly wadded quilt the futon which she rolls out over the tatami, the straw mattresses covered with finely woven bamboos that are upon all floors in Japanese rooms (excepting only the daidoku or kitchen). “‘That is the bed and if you will condescend augustly to arrange your honorable body on anything so unworthy, Okamisan (the sweet little wife) will be bewildered with the honor. 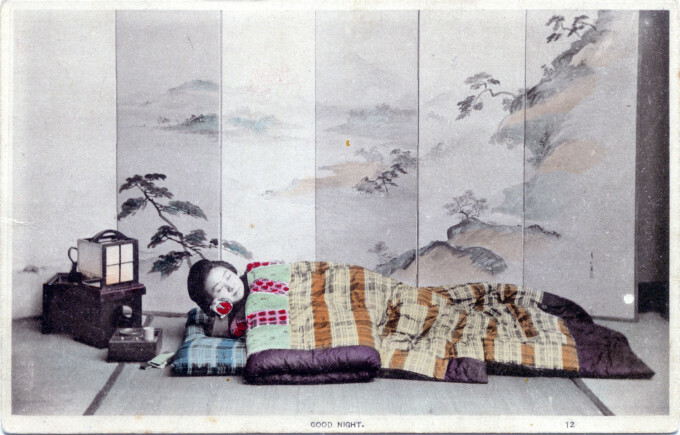 “Good night”, c. 1905. Futon assembled on tatami. “‘The futon are spread out one upon the other and a sheet perhaps is laid on top. Sheets however are new to Japan. Then comes the big yagu or top futon which is longer than the others and has sleeves like a huge kimono. This is bunched up at the foot of the bed ready to be pulled over you when you have lain down. “‘The small object at the head of your bed which looks like a cigar box on edge surmounted by a roll of paper is the makura. No one need envy your first night’s experience with it. You will discover that your head is as heavy as though it were solid lead and therefore which is all the comfort you ll have out of the sensation that it cannot possibly be empty. You will likely dream of being beheaded or unheaded and of falling over the brinks of precipice after precipice.